If you’re a car enthusiast, you know that it can be difficult to maintain your vehicles, especially if you’re doing it on your own. It can be easier to pay to have a car detailed, but it’s possible to take care of your car yourself and save yourself some money. Also, you get to spend quality time with your car while you’re working on it. Before you can start detailing your car yourself, you have to do your research and invest in reliable tools. One of the first things you should look into are orbital polishers. Fortunately, we have already done the research for you. We found the three best options, at the best price. If you’re looking for a reliable tool to help you polish and wax your car, buying an orbital polisher will be one of the best options for you. 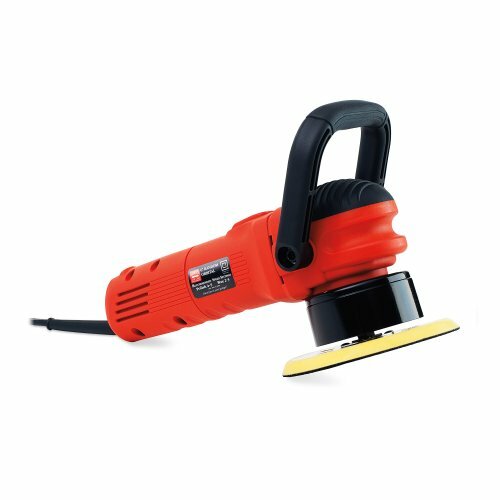 There are many different kinds of orbital polishers on the market, and the Griot’s Garage 10813LNGCRD 6″ Dual Action Random Orbital Polisher is a popular choice for consumers. This specific tool has a 7-ampere, 850-Watt motor, making it a powerful addition to anyone’s collection. The handle is adjustable with a rubber grip that has molded hand and finger grips and a domed, palm grip in order to make it easier and safer to use. It has 6 different speed settings, a 5/16 inches diameter offset, and low-end torque to give the user more control. This device also includes a 6-inch hook and backing plate in order to make mounting and removing pads easier on the consumer. You can choose whether you want the 10-foot 18 AWG or the 25-foot 16 AWG power cord when you purchase one of these polishers. All of the downsides to this specific product involve you having to make additional purchases to have the best experience. If something like extra pads and extra polishing fluid aren’t really in your budget, then this tool may not be the one for you. After the first use, most of those materials that come with your purchase are already halfway or more than halfway gone, so you’ll have to begin purchasing these items yourself fairly soon. Despite the negatives to this orbital polisher, it’s still a good option for the casual customer interested in maintaining their car themselves as opposed to paying someone else to do it. One of the best things about random orbitals specifically is that they are almost error-proof. This means that if any accidents occur while using the device, like if you accidentally hit something that you shouldn’t have, the polisher won’t greatly affect it. It’s forgiving to new users while still maintaining a powerful motor that effectively removes scratches and renews old paint. It makes polishing and restoring your personal vehicles an easier task, whether it’s your car, a motorcycle, or a garden tractor. It’s not as powerful as those used by professionals, but it’s a reliable tool for the average consumer. And with its user-friendly grips and individual speed settings, this tool is safe and can be altered to fit whatever job it’s needed for. There are other polishers available on the market, but this one by Griot’s Garage is one the best ones in this price range. If you’re interested in trying this tool out for yourself, click here to buy from a trusted seller. Whether you’re looking to renew the paint on your car or your boat, a polisher can be a great investment for the average person. 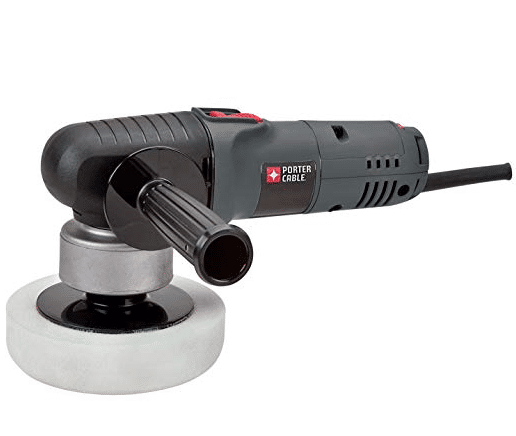 There are many different brands and various kinds out there, but the Porter-Cable 7424XP 6-Inch Variable-Speed Polisher has been shown to effectively enhance and improve your vehicles with minimal hassle. 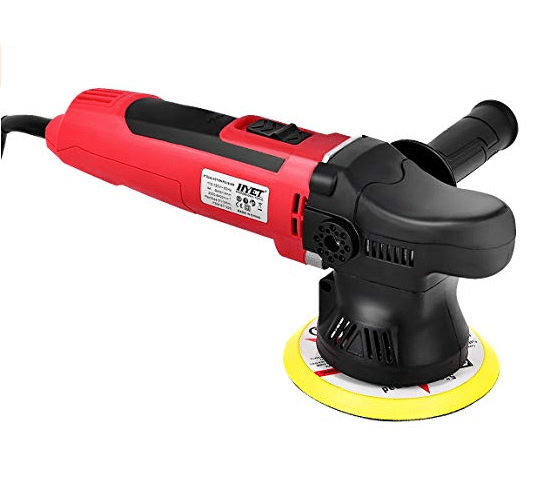 This device includes a 4.5 amp motor to help with high overload protection, and it has a random orbit to achieve swirl-free sanding and polishing. Spindle thread accessories between 5/16 to 24 can be used in this device, and it maintains a full ball and rolling bearing construction. This Porter-Cable polisher is one of the more compact of those currently available at only 5 ½ pounds and measuring 11.5 x 10.5 x 6 inches. It features an electronic and variable speed dial that slides between 2500 and 6800 orbits per minute. There is also a removable side handle that can be situated on the left or right of the device and a counter weight, giving the user the freedom to adjust their grip and giving them more control. 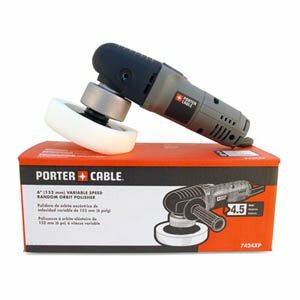 With variable speeds and a compact frame, this Porter-Cable polisher is a high-quality product. It’s known to do a good job correcting things like paint damage and heavy swirls. Big corrections can also be achieved as well, but you have to go slowly and take time with them. Even though it can be difficult to get the polisher to do what you need it to at those lower speeds, it’s going slowly enough that you can adjust yourself and make it work for you. Though the pad it comes with isn’t the best for refining and sanding your vehicles, there is a quick fix for this error. Instead of using that, many customers prefer to purchase other pads and a Velcro backing plate. Doing this could be necessary to achieve the look you want. However, this isn’t something you have to do. The great thing about this product including that 6-inch pad is that you’re able to use this tool as soon as you get it. The manufacturers support their products and their consumers, so you can rest easy knowing that if there is anything wrong with the tool or if any part of your device becomes worn, you can rely on them to replace it for you. You can rely on both the three-warranty and the one-year free service contract, neither of which come at an additional cost to the buyer. 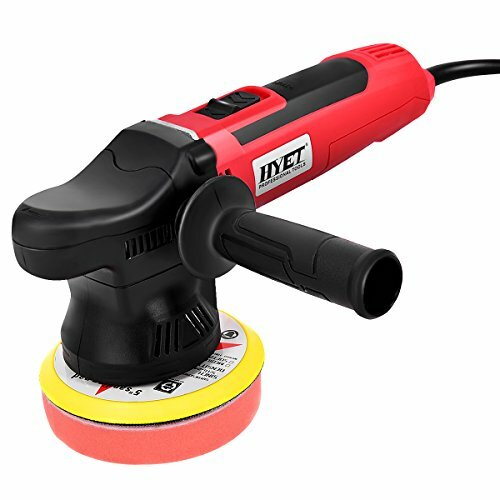 This polisher is reliable and effective, making it a great addition to any car enthusiast’s workshop. Click here to buy from a trusted seller. If you’re looking for a tool that can switch easily between sanding and polishing, a random orbital polisher is exactly what you’re looking for. Whether it’s for your home or your vehicle, these devices are good to have in your toolbox. If you’re new to this, it’s easy to be overwhelmed by the different specifications and dimensions of popular products. When it comes to purchasing an overall good and reliable device, the Goplus Dual-Action Polisher is one to keep your eye on. This device is durable. Because it’s made of anti-impact polyamides and sits at 7 pounds, this tool is one of the more heavy-duty ones on the market. This makes it able to withstand long-term use. It allows the user to control the speed of the device with the dial control system. The speed can be changed to anything between 2000rpm and 6400rpm. This product includes a high-quality, fine cooper motor at 560W that has heat treated precision cut gears. It also comes with a thick, 5-inch, sponge pad that fits the hook-and-loop polishing plate design. The D-type adjustable handle that accompanies this device sits on the side of the tool and makes gripping and controlling it much easier. Every customer should keep in mind that this is one of the heavier products on the market, so it may seem or feel bulky at first. If you prefer something smaller and more compact, this wouldn’t be the tool for you. Also, there have been instances where the product becomes faulty or some of the switches become stuck, so if you do purchase this, make sure to thorough investigate it once it arrives. If anything is wrong or doesn’t work properly, you should contact the seller as soon as you can. Despite the potential for defect, this tool has been a popular choice among customers. Even when there is an issue with the product, the manufacturers are quick to respond. 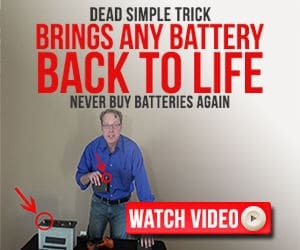 The best thing about this device is that it is easy to learn and manipulate, even for someone completely unfamiliar with it. It’s good for customers who are new to enhancing or refining their cars with these kinds of tools because the features focus on control. It does a good job maintaining the sleek look of your vehicles whether they’re cars, boats, or tractors, and it can be used for any of your other sanding, polishing, or grinding needs. Even with its bulkier frame, it’s balanced so that it’s not difficult to manipulate around the curves of your vehicles. 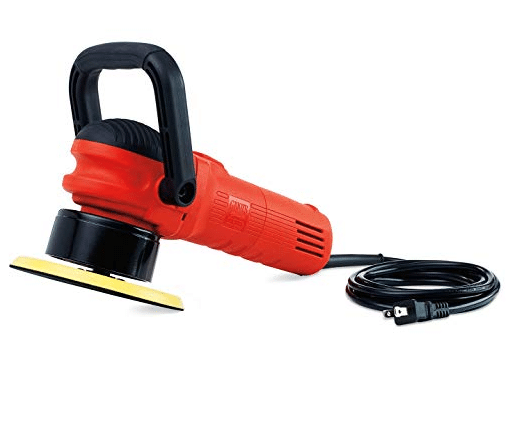 For any at-home needs, this polisher is reliable. This Goplus polisher is definitely worth the money. If you’re interested in purchasing one of these tools for yourself, click here to buy from a trusted seller. 【Stable And Durable】Heavy duty and compact construction, it's made of durable anti-impact polyamides housing with heat treated precision cut gears and high quality fine cooper motor. All makes our Random Orbital Polisher strong and durable enough to withstand heavy and long term use. 【Variable Speed Control】User-friendly convenient speed dial control system, fine cooper motor, provide strong power with lower electricity consumption. Variable speeds control, allows no-load speed from 2000rpm to 6400rpm. Also equip with convenient constant speed switch. 【Externally Sponge Round Pad】Package comes with a thick sponge pad. This professional high performance dual-action polisher detailing system allows you to polish the full spectrum of coatings. Hook and loop polishing plate design, fit 5" standard polishing pad. 【D-Type Handle Easy Control】It features an easy control D-type handle, also comes with a grip handle, meet your different demand. Made of dull polish, anti-skid and sweat-proof material, ensures firmly hold during the work. 【Easy to Use with All Necessary Attachments】Light weight and portable makes it easy for carrying and storage. 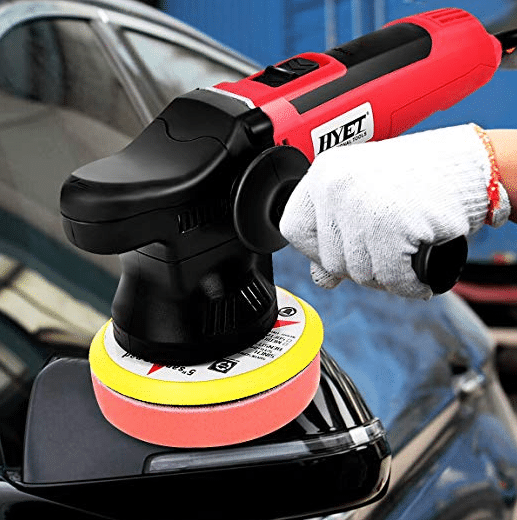 Our professional DA polisher is very easy to learn and operate, never hurt your car paint, extremely fit beginners. Perfect for both home DIY or commercial applications like auto care and maintenance. What Is an Orbital Polisher? An orbital polisher is tool typically used to polish and remove marks from the exterior of a vehicle. These tools have been used for cars, motorcycles, boats, and tractors. It’s called an “orbital” polisher because the rotation of the head mimics the orbit of the earth. It rotates on a central spindle, which then also rotates around an offset that is eccentric, or not centralized. The rotation of the pad creates an irregular motion that some refer to as “jiggling.” This motion is what prevents the polisher from burning through the clear coat and getting to the paint beneath it. Because of the jiggling, the polisher doesn’t remove the paint of the car regardless of the power of the motor or the speed of the pad. This same feature also keeps the polisher from getting rid of any deep scratches, though it does help improve the appearance of scratches and swirls. Deeper scratches require something more like the rotary or circular polishers. For people who are new to polishing their cars themselves, this tool is a good purchase. It’s user friendly because the device produces very little heat in comparison to other kinds of polishers like a rotary. It improves the look and texture of a car’s paint job with little risk to the car and the user. It’s also safe, and most devices come with handles or grips that help a user maintain control over the tool while using. There are a variety of brands and specifications, but to just start out, a basic, compact orbital polisher is the way to go. Whether it’s your first or your fourth time buying something like this, do make sure to research the tools you’re interested in and keep an eye out for reviews. You want to make sure that you purchase a device that is reliable and has withstood the tests of time. It’s also important to know the different pros and cons of different manufacturers. Some provide warranties while others don’t. Some provide materials to get you started, and some provide just the pads for the device. Many of them have various speeds and adjustable grips, but it doesn’t hurt to double check. You’ll have to gauge for yourself what you’ll need when it comes to making that final purchase. If you’re thinking about doing some car maintenance on your own, take a look at some of the popular polishers among customers. Just because you’re a beginner, that doesn’t mean you can’t invest in something worthwhile and effective.